No, that pic above isn’t a joke – up until 2009 the largest bank note in Zimbabwe was 100 Trillion dollars. That, by the way, was worth a whopping $5, and you can now get one on Ebay for around $2. I was so excited back in 2006 when I picked up my 25 billion dollar note (I got it in South Africa), but that’s only loose change in Zimbabwe. These notes weren’t in circulation when I visited Burma, but I had to buy some. Who in their right mind thought it was a good idea to have a 15, 35 and 75 Kyat banknotes. They do love their horses in Mongolia. Every single note had a lovely etching of frolicking mares on it. It was also one of the most difficult currencies to pronounce in my travels: Toogroog? Tugrug? TowgRowg? Or something like that. This was funny money because it was worth sod all. Actually, it was worth something, but there was nothing to buy in East Germany. Back in the 80s you could cross into East Berlin for the day, but you had to exchange a 25 Marks at a 1:1 exchange rate with the West German Mark – although you could easily get the Ostmark on the black market at 5:1. The only problem was that unless you wanted to buy badly-made plastic buckets or terrible food there was nothing to spend your money on. 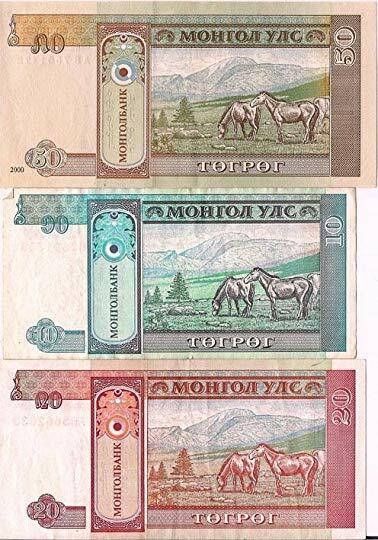 The country was so exciting that they put industrial chimney stacks belching out smoke on their 50 Mark note. I visited Russia twice – back in 1992 and in 2001. Back in ‘92 the restaurant food was inedible and GUM department store sold badly-made plastic buckets. In 2001 the restaurant food was unaffordable and GUM department store sold Armani suits. The money had changed also – but I think I preferred the old 10 ruble note. It looked more, well… Russian! Travels in my Shoebox – Beer Coasters Five ways to poo your pants.